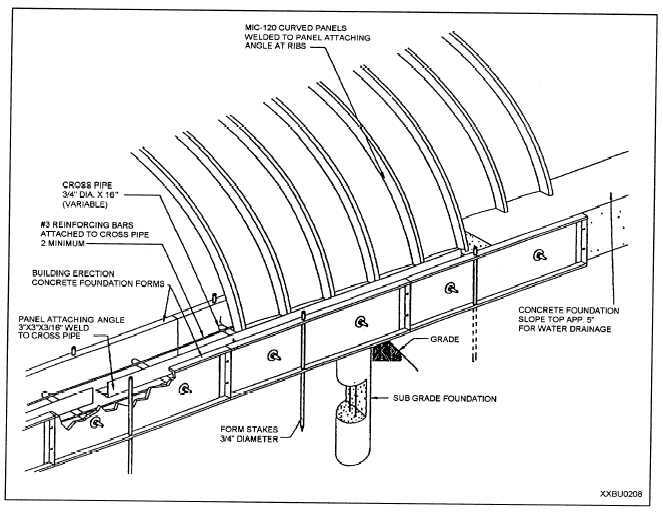 Home > Construction Training Manuals > Builder Advanced > Figure 9-16.Building Foundation Concept. place, and remind crew members to keep their feet from under the ends of the arches. You must never attempt to lift sets of panels in winds exceeding 20 mph. Place the first set of panels on the attaching angle of the foundation and position them so there will be room for the end-wall panels. After the first set of panels are positioned, clamp them to the angle, plumb with guide ropes, and secure the ropes to previously anchored stakes. Detach the spreader bar and continue to place the panel sets. Seam each set to the standing panels before detaching the spreader bar. After about 15 panels (three sets) are in place, measure the building length at both ends (just above forms) and at the center of the arch. This measure- ment will seldom be exactly 1 foot per panel (usually slightly more), but should be equal for each panel. Adjust the ends to equal the center measure. Panels are flexible enough to adjust slightly. Check these measurements periodically during building construction. Since exact building lengths are difficult to predict, the end wall attaching angle on the finishing end of the building should not be put in place until all panels are set. After the arches are in place, set the longest end-wall panel in the form, then plumb and clamp it in place. Work from the longest panel outward and be careful to maintain plumb. Figure 9-16. - Building foundation concept.